Don Pinger sees nothing particularly notable about his career transition from chef in the classical French tradition to artisan in decorative concrete. "Everything I've done has some sort of artistic component to it," he explains. Pinger's second career began with a little dabbling in utilitarian concrete. That was seven years ago, when he was still working long hours in the restaurant he owned. "I sold it when I got tired of working nights and weekends." Also, he'd been reading about what people were doing with decorative concrete, and that intrigued him, he says. Today, Pinger's Custom Concrete Solutions LLC, of West Hartford, Conn., operates an appointment-only showroom. "His samples are like museum pieces," says Joe Morrone, a client and showroom visitor. The space is Pinger's base of operation for handling the requests of a roughly 50-50 mix of homeowners and commercial clients. His commercial customers include banks, spas, schools, fitness centers, supermarkets and other retailers. "I started with residential, then eventually realized that I wasn't going to get rich since there are so many wood floors in my region of the country," he says. "After two and a half years, I started getting commercial jobs." Pinger runs a lean operation, with a staff that ranges from as little as four employees in the winter to as many as eight in the summer. One of the ways he generates interest for his services is through the "Request a Bid" field on his Web site. "It's brought in quite a bit of business, or at least interest," he says. "Some are serious inquiries, though quite a few aren't. Often it's a matter of the curious stumbling upon my Web site and discovering decorative concrete for the first time. It's an educational process for a lot of people because it still isn't that well understood where I'm at." Realizing that even some of those less-than-serious prospects can eventually become customers, he treats all inquiries as conversation starters, discussions he's eager to engage. 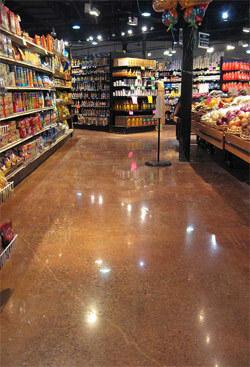 Pinger gets work in concrete polishing and resurfacing, epoxy floor coatings, stamping and acid staining and dyeing. 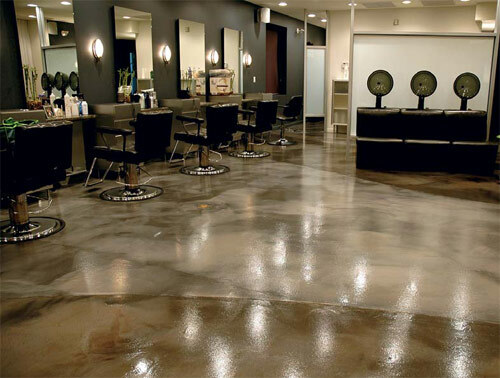 "Concrete polishing," he says, "is the perfect complement for concrete floors. For moisture problems it's dense but not sealed, so moisture comes out. It's the ideal treatment for an old floor that's not in that great of shape." Epoxy, says Pinger, is useful at commercial kitchens, hospitals and other job sites where the finished floors can't be porous. "I can use it to create any look my clients request, but at nowhere near the cost of marble or granite." He explains the appeal this way on his Web site: "It may look and spread like paint, but the difference between epoxy flooring and paint is its durability. 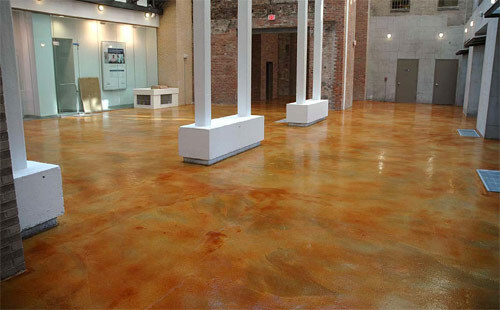 Once sealed and dry, an epoxy coating is impervious to automobile fluids, grease, oils (and) industrial solvents, making it easy to clean while aesthetically more appealing than (bare) concrete." 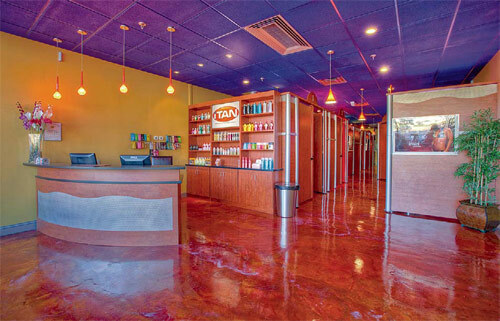 The iTan tanning studio in Norwalk, Conn., is one of many recent epoxy coating projects that stand out. Pinger started the late-summer-2009, six-day job by cleaning, shotblasting and patching an uneven floor that had seen better days. Then he poured a 1/8-inch jet black coat of Ardex self-leveling polymerized cement underlayment. The underlayment leveled the floor and filled in multiple surface scars and pockmarks. The black topping was also used because, Pinger says, he "wanted to give the floor a dark counterpoint." After buffing, he chose as a cementious coat Elite Crete's Thin-Finish, applied with a squeegee. The primer coat of epoxy applied next contained Reflector Enhancer, a metallic additive also from Elite Crete, in russet. Pinger then put down a thicker epoxy coat spiked with a dazzling blend of Reflector Enhancer in russet (again), orange-gold and charcoal tones. He swirled the colors together on the floor. Pinger and his crew weren't done with the metallics even at that point. As a final, glittery touch, they sprinkled Laticrete's SpectraLock Dazzle in gold and opalescent pearl tones. His tool of the trade? A powdered sugar shaker, evidence that he hadn't totally divorced himself from his former career. "You can clearly see all of these colors in the finish," says Pinger. He topped off his creation with a solid coat of clear urethane and three coats of wax. The result is a shimmery, nearly mirror-like surface that delights in picking up the space's other mod colors and shifts of lighting. These same basic steps and the featured addition of Elite Crete's Reflector Enhancer metallics have been repeated in other commercial projects, including the 2,000-plus square-foot Nelson's Spa, a high-end salon and spa in West Hartford. "I think restaurant people have more flair for something that's different," says Pinger, discussing a particular client subset of his. But he could also be referring to his own background and attitude toward visual drama. He has a kindred spirit in restaurateur and client Joe Morrone. Before opening Cafe Buono in Bristol, Conn., Morrone made the decision to let his floor take the lead creatively in the 2,000 square feet of dining space. "Everything was based on the floor," he says. "It would tie the room together and I could base the rest of my decorating on it." Morrone had seen plenty of decorative concrete in an earlier career as a cameraman in New York City. "We'd walk onto a location, and every time it had concrete flooring I noticed it." What he wanted to see in his own place was that newer, edgier look of concrete. "Ambience is something you can sell in a restaurant," he explains. But in his region of Connecticut, the flooring option just wasn't widely known. His own father - a veteran building contractor - was hard to convince. "He thought I was crazy," Morrone recalls, chuckling. "We actually had a few heated discussions about it." The younger Morrone held firm and called upon Pinger to pour his floor in the new building and add one of his custom epoxy coatings. "Don is an absolute artist and a real gentleman to talk to," he says of his contractor. "Just like I thought was going to be the case, it's the floor that everyone talks about. The price was right in the ballpark when compared to tile, but well worth it when you consider the wow factor. Everyone's seen tile a million times. Now even my father's a fan." When asked about the keys to his success, Pinger quickly questions the assumption that he is successful. "Success is a dynamic thing, not a static thing. One has to continually change and learn and grow, or become complacent, and it shows in your work." He says one of his strengths is that he tries to keep an open mind to new ideas and techniques. Also, he's involved in every job personally. "It's me the customer deals directly with from start to finish. It's a lot of extra work, but I would have it no other way." His next move might be a line of "very artistic pavers" he and a friend are developing. They're experimenting with different colors, textures, styles and materials. For years, he says, he's been hearing from customers about "how they like the idea of pavers but feel like they all come from the same big-box store." His, he feels, will be different. On the installation side, his outfit is starting to take on wall-finishing jobs using a range of cementitious and Venetian plaster products. "It's just one more thing we can offer," he says. "We have a few contractors we do a fairly regular amount of work for that have asked us on several occasions to do this, and we've finally decided to really commit to it. Plus, it's interior work and you can't beat that."